A truffle is an underground fungus usually found in close association with a tree. Many species are rare, edible and as they are considered to be delicacies, are among the world's most expensive foods. There are dozens of different species, but the best species can cost over €10,000 / kilogram. A single white truffle was once sold for £165,000! To reproduce, truffles rely on being dug up and eaten by animals and then spread in their dung. Their aroma attracts such animals and also appeals to gourmets. This aroma has been used by truffle hunters with pigs to locate this buried treasure. Today, it is trained dogs that have largely replaced pigs. On the continent and in other countries truffles are big business. In England, a number of species of truffle can be found in the wild. While not as well known than as their continental cousins - The Périgord Black and The Italian White - they are still prized for their culinary value. Two types are of particular interest. Both grow just beneath the ground surface near beech, hazel, oak and birch trees and grow best on the rich soils found on chalk. The chalk downs of Kent, Surrey, Wiltshire and Hampshire were the centre of truffle hunting businesses in the 18th to early 20th centuries. The Wiltshire village of Winterslow, sometimes described as the headquarters of English truffling, had 10 trufflers. The last professional trufflehunter until recent times, Alfred Collins of Winterslow, retired in 1930. Working with two Spanish Poodles, he could collect 11 kilograms on a good day. 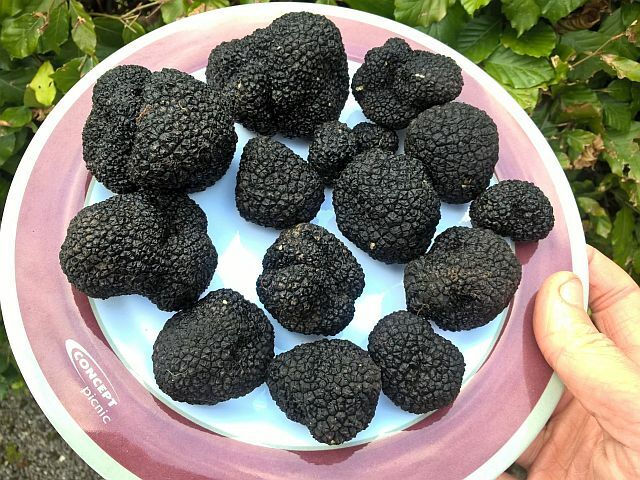 Today, there is a growing interest in English truffles, be it in buying and cooking with them or truffle products such as oils, participating in a truffle hunt, growing them in a garden or commercial plantation or training your dog to find them. 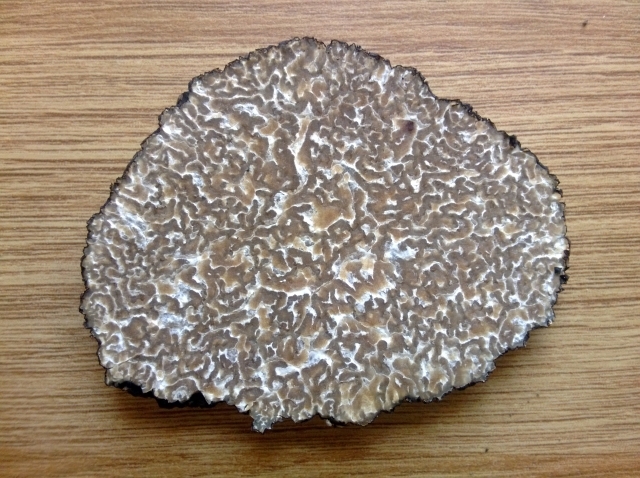 The Summer Truffle (Tuber aestivum) is the commonest species in Europe. The skin is black in colour with pronounced pyramid-shaped warts. When cut in half, they have a white marbling on a pale cream to light brown background. They may ripen as early April or May and continue fruiting until Autumn. The flavour, described as nutty-tasting, and aroma are more subtle than the well known varieties but can still command prices of several hundred pounds per kilogram. The Autumn or Burgundy Truffle (Tuber uncinatum) is a very close cousin to the Summer Truffle with similar size, shape and colour. It is found in many parts of Europe and is highly prized. They ripen later in the year from August to January or February. When ripe, it has a darker brown, marbled flesh. The aroma and taste are much stronger than their Summer counterparts. They command higher prices. 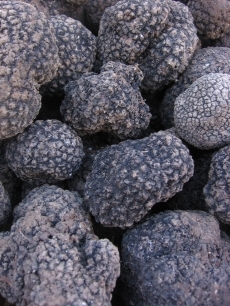 The skin of Autumn or Summer truffles is black in colour with pronounced pyramid-shaped warts. Autumn truffle cross-section, darker brown with a marbled pattern. To buy sustainably harvested, fresh English Autumn truffles click here. Truffles can be an ingredient in all courses of a meal - starters, main courses and even desserts. For information, ideas and recipes see our cooking with truffles page. We are regularly contacted by people who think they have found truffles. While some people have, many have not finding another type of fungi. 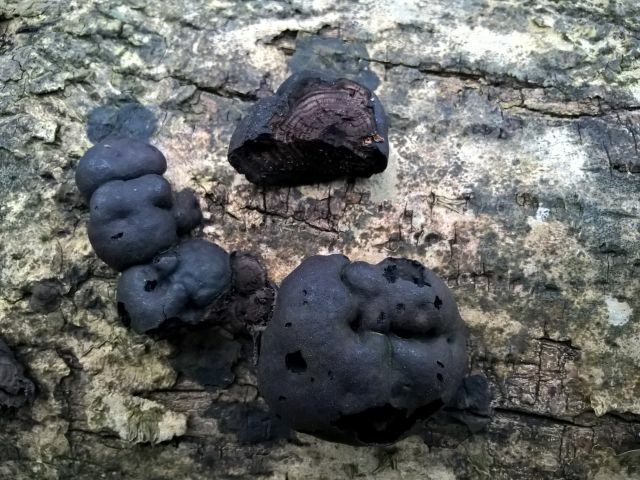 As above, truffles grow just beneath the ground surface near beech, hazel, oak, birch and other deciduous trees, most commonly on alkaline soils such as found on chalk or limestone. Earthballs look a little like a warty potato. They are found on acid soils (e.g. wooded heathlands). They vary in colour from light brown to brown and usually have a yellow tinge. 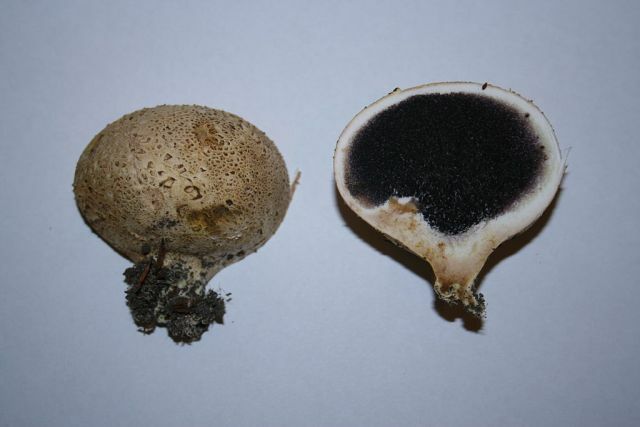 If you cut a mature specimen in half, it will be made of a black powder (the spores). An Earthball will give a stomach upset if eaten. You can see more images / learn more about the Earthball here. 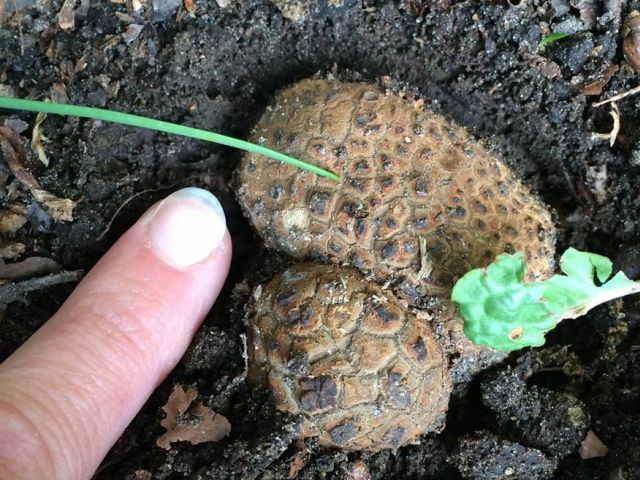 An Earthball - NOT a truffle. it is probably a Cramp Ball or King Alfred's Cake - do not eat! If what you have found is on the roots of a tree, possibly in a cluster and looks like the below, it is a plant gall. An Oak Apple is the most well known type of plant gall. A plant gall on tree roots - NOT a truffle.